The golf rules are from How To Be A Retronaut ( retronaut_feed), which is filled with many other good things. It seems there are hundreds of versions of this pic now but that one made me laugh earlier. Ah, US politics is OK, that's not a sore subject tonight. Same pic was on HIGNFY with Princess Beatrice's hat on everyone, that made me chuckle. 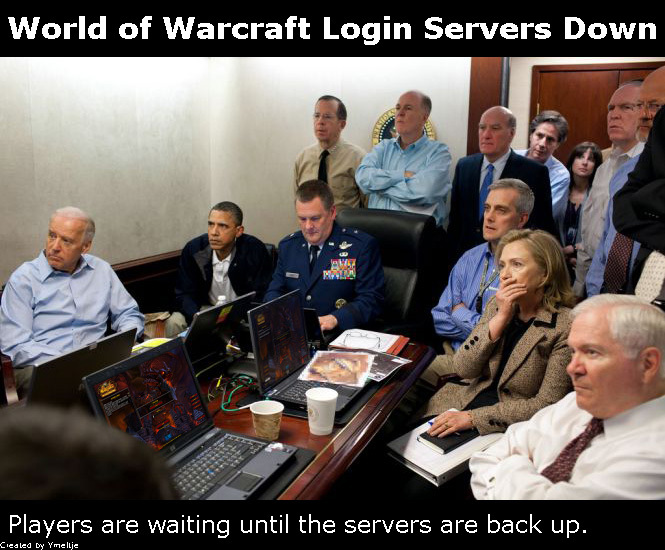 The question is, are they playing Alliance or Horde? Heh at the first one. There's a tetraptych at the Fitzwilliam Museum raggedy_man identified as YCMA (the Y also a crucified Jesus) and claims they deliberately changed the order so it wouldn't be obvious. ;o) Unfortunately the Fitz bans photography in the galleries so I can't provide proof. Thank you for the first one! Gleefully stolen. Victoria Coren is one of those people I find pretty attractive, but also feel a bit like I shouldn't. A little like Sue Perkins, but that's for a different reason, really. The following definitions of a Sportsman was drawn up at a meeting representative of all ranks at the Army School of physical training, Aldershot, in 1919. Units represented were of the home forces, France, Italy, Egypt and Mesopotamia. 8) Never interferes with referees or judges, no matter what the decision.